We have owned a copy of Aristotle's politics for countless years, featuring a funny old chap on the cover apparently wearing a tea cosy6, and I have not read it up until now. I suspect I've bounced off it a few times, and only finished this time after a few months. The Internet Encyclopedia of Philosophy2 tells me it is his lecture notes3, and it reads like that rather often: not properly systematised, incomplete and repetitive. Although starting perhaps from Plato's views A is differently directed: rather than building a theoretical edifice5 he is more interested in practical observation; indeed part of the tedium is him attempting to categorise everything and failing. Hobbes's "there are only three forms of govt" is I now realise a response to A's six1. I ignore the aspects of slavery and treatment of women as being irrelevant here. A's context - a city-state amongst others - is different from today. I'm not at all convinced that the "A has been influential down to modern times" meme is of any utility; he's just another dead white male. But mostly, and mostly interesting to me, A is interested in trying to balance different power blocks within a city, or rather - since I don't think he has much useful advice to offer, other than "think about it" - he observes various different efforts. In the end, shorn of detail but retaining the bit that interests me, it comes down to trying to balance one-man-one-vote, and one-dollar-one-vote8. Nowadays we fetishise democracy and find it hard to believe that anything other than OMOV makes sense or can be justified, whilst living in a system that we know doesn't actually operate this way except on the crudest and most superficial level. People tend to denounce ODOV7 as an obvious evil, though without any obvious thought; and things done without thought are not always good. A, who is generally in favour of compromise and avoiding extremes, advocates a compromise between the systems; and I think that's about right4. CIP is unhappy about me suggesting [giving] power to the rich. He doesn't use the G-word but I think it is implied. My reply on reflection is incomplete, because what I forgot to say there is that this is about recognising where power lies; not about shuffling it around, still less about "giving" it to people or entities. Having a political theory that doesn't match reality leads to much unproductive discourse. Closely connected with this is the usual attitude of the conservative to democracy. I have made it clear earlier that I do not regard majority rule as an end but merely as a means, or perhaps even as the least evil of those forms of government from which we have to choose. But I believe that the conservatives deceive themselves when they blame the evils of our time on democracy. The chief evil is unlimited government, and nobody is qualified to wield unlimited power. The powers which modern democracy possesses would be even more intolerable in the hands of some small elite. It is not democracy but unlimited government that is objectionable, and I do not see why the people should not learn to limit the scope of majority rule as well as that of any other form of government. At any rate, the advantages of democracy as a method of peaceful change and of political education seem to be so great compared with those of any other system that I can have no sympathy with the antidemocratic strain of conservatism. It is not who governs but what government is entitled to do that seems to me the essential problem. 1. For H, they are democracy, aristocracy and monarchy; being rule by all, some or one. A has these, plus their "bad" (or "perverted") versions for a total of six, where the difference is whether they are run for the common good, or the good of only a few. This is a typically A-type attempt at classification that probably means little in the real world. 2. The wiki article is poor. 3. As does the Stanford Encyclopedia of Philosophy. 4. Foes of inequality will be delighted to know that he regards inequality as a source of division and revolution, and therefore wishes to minimise it. They may be less pleased that he doesn't regard it as bad in and of itself. 5. I was skimming by the time I got to book 7. 6. I now realise it's the bloke on the left in this picture. See-also here. 7. As should be clear from the preceding, and from the update, one-dollar-one-vote isn't a replacement for OMOV, but is to be understood as alongside it. 8. By chance, I discover that I briefly talked about ODOV back in July 2018. * Men spake from God being moved by the Holy Ghost / Every man in his own language. I guess it's hardly surprising that you either missed or chose to ignore what Aristotle would likely have considered central: the difference between just and unjust government. I think the great political problem of our age is something else: the lie. If politicians can lie then this does not give equal advantage to both sides. The lies of politicians representing the status quo are not effective because the status quo is familiar to people. But the politicians representing "the great and good alternative way" have scope to lie all they want, because the "alternative way" does not have a reality that can be compared with what the politicians say. Hence Brexit. The reality of what the EU represents was fighting against a fantasy. OK, so you didn't ignore Aristotle's central point, you just relegated it to a condescending and dismissive footnote without substantive content. It's generally a good idea to read people's posts before sneering at them. I wasn't terribly interested in the distinction, and so wrote a post about the aspects I was interested in, which seem under explored to me. By contrast just government is endlessly if largely pointlessly debated. But, if you're interested in the topic, feel free to share your thoughts either here if brief or in a blog post if more expansive. Hey, I thought my critique was fairly polite. I had actually read even footnote 1 - not my usual practice - before I wrote my first comment - I just didn't see much to see there. So far as I can tell - and I'm old and not too bright, so I might be wrong - the only thing you took away from Aristotle was that power to the rich was a good idea. I don't think I'd put it that way; A doesn't. What he does say, and what I do agree with, is that balancing things is good. Asserting that all power flows from voting and that all are equal and that is all, does not I think make sense. And yet that's the illusion we're supposed to labour under. Some power flows not from voting - which is to say, towards the state, for coercion - but from the market, which is to say, from voluntary exchange. "I now realise it's the bloke on the left in this picture"
The hats suggest he and Plato are headed for a rap duel at the Academy. Who's the dude in the foreground? 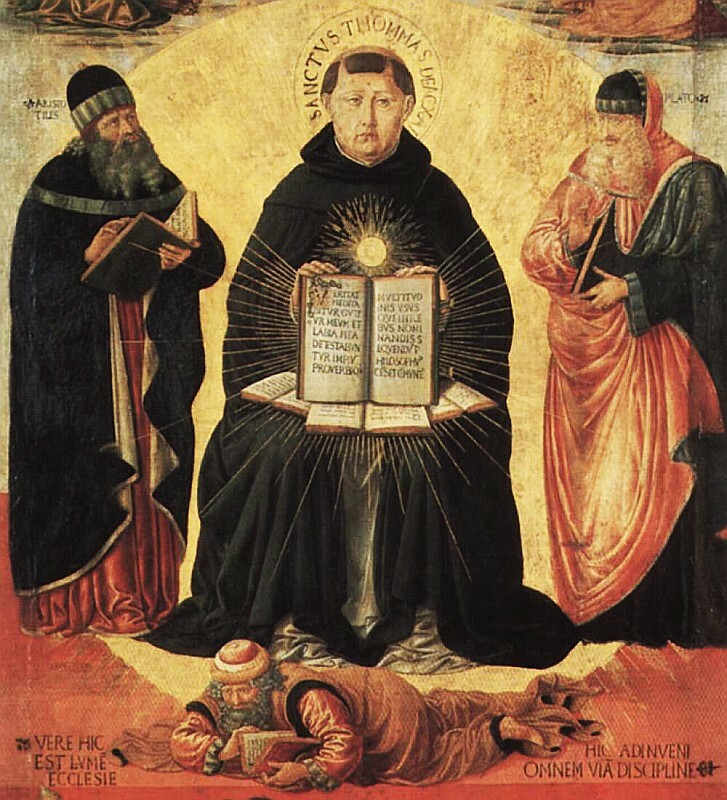 Thomas Aquinas, who wrote a blog commenting on Aristotle way back. Perhaps I misinterpreted. Do you want to define ODOV? I'm afraid I read it as "One Drachma, One Vote." I was thinking of Dollar, but Drachma will do. I wasn't proposing it as a pure replacement for voting, but as alongside. I'll add a note to clarify that. "Nowadays we fetishise democracy and find it hard to believe that anything other than OMOV makes sense or can be justified, whilst living in a system that we know doesn't actually operate this way except on the crudest and most superficial level. People tend to denounce ODOV7 as an obvious evil, though without any obvious thought; and things done without thought are not always good. A, who is generally in favour of compromise and avoiding extremes, advocates a compromise between the systems; and I think that's about right4." So you say we all know we don't live in a OMOV democracy and support the 'compromise' (not specific about what a compromise is). If we don't live in OMOV, aren't we already living in a compromised democracy? It also seems to me that the only way this compromise is maintained is by supporting and maintaining the OMOV side, as the ODOV side is very powerful. If you support a different sort of compromise, what is it? Given the amounts spent in the US on election campaigns a vote would appear to cost more than a dollar. I doubt that; I think many people think we do, or we live in something close to it, and that as an aspirational ideal we should aim for it. I'm not sure it needs much support. It is the dominant ideology, almost anyone you pick will tell you they believe in it and support it. It claims authority. Why does it need support? By contrast, ODOV is the power that dare not speak its name. There are other powers in the world than democracy and Official Govt, yes. Given how badly govt does (Brexit, Trump) I'm quite keen on other things. But it is hard to talk about fixing problems with the other things, if the only thing people can think of is yet more heavy handed govt. "we all know we don't live in a OMOV democracy"
"whilst living in a system that we know doesn't actually operate this way except on the crudest and most superficial level." in the OP. "Why does it need support?" Because once in power, the dollar typically has more influence over politicians. They only consider OMOV at election time. "By contrast, ODOV is the power that dare not speak its name"
"There are other powers in the world than democracy and Official Govt, yes. Given how badly govt does (Brexit, Trump) I'm quite keen on other things. But it is hard to talk about fixing problems with the other things, if the only thing people can think of is yet more heavy handed govt." Well, the problem here is that you complain a lot about Govt, but don't offer a different solution. You have no specific thoughts on what the compromise between OMOV and ODOV would be, despite already noting that it exists. Also this language is emotional, loaded and unhelpful. Yes, that's true. I don't feel obliged to offer a solution. To avoid doubt, I say that I don't have a solution, and can see no path towards providing a theoretically satisfying solution, other than minimising the influence of govt. I don't see that as a problem, though, to the initial task of deciding if there's an issue there or not. There's no point in expending effort on designing a solution until a reasonable number are convinced of the problem. There are other ways of deciding things other than governments. Clans and tribes and extended families. La Cosa Nostra. Various one person has all the power schemes... which can work out ok if the person is both very sane and very interested in the future's judgement, and not so well all most all of the time. I don't see how a mostly democratic government is a problem that needs to be corrected. Not ideal, of course, but a realistic option. The alternatives are far worse. ODOV means that a very wealthy person can "vote" to change the rules to give him more wealth, and thus more power. I don't see how that ends, other than badly. "other than minimising the influence of govt"
This is independent of the OMOV vs ODOV vs mixed. You've been listening to too many "the Koch's have all the money" fools. No one person or group has a majority of money. I didn't say that had it all, or even a majority, just that there is a risk that someone with 'sufficient' could change the laws to increase their own wealth. And from there seek to gain control. And Phil and I saw that risk immediately and independently. Seems pretty obvious. The net impact of individual wealth on society at a national level has disappeared in the OECD. While Rockefeller actually had a significant portion of American GDP at his disposal (and he did dispose of much of it), the combined wealth of Bezos, Gates and Buffett don't amount to even an asterisk in our national accounts. If you have ODOV, it quickly overwhelms OMOV - there's trillions of Dollars, and only millions of people. Votes from individuals will effectively be worthless. Maybe it would hard for an individual initially, but there's a possibility for wealthy groups to take over and then remove a whole lot of laws that currently re-distribute wealth. Then they will have the power. It also raises the question of when do you count the dollars to compute who gets the votes. Dollars are constantly in motion. Errm, you weren't really under the impression that the scheme was to be anything as primitive as Total_Votes = Votes_By_People + Votes_By_Dollars, were you? @Tom - I don't think that you are right. The Bezos family may only personally own a bit more than 0.1% of the of the US national wealth, but Amazon, which he controls, has more than 1% of US national wealth. Apple and Microsoft have similar shares. @Dr WC - Even if all billionaires were automatically disenfranchised, they would still have great personal and political power. If you gave them more political votes by any plausible wealth formula (keeping in mind that the richest 100 people have more wealth than the poorest 40 or 50%)- and you were the one who came up with the ODOV formula - that would only increase their already dominant control. You can errm away, but I think you are the one who needs to explain why your ODOV means something significantly different from the obvious. That doesn't make sense. Arithmetically, because Bezos owns 16% of Amazon; and 0.1 % * 100/16 ~ 0.7%. But more factually, because 16% of Amazon does not give you total control of it. Of course. And that is exactly what I'm trying to say. Have you read the "update"; is it really so difficult to understand? I'm not sure how to say it any plainer. People with dollars already have power. I'm not proposing to *give* them anything more, as I've already explicitly said. Indeed I don't think you can meaningfully "give" people political power. "0.1 % * 100/16 ~ 0.7%"
"democracy...the least evil of those forms of government from which we have to choose." "It is not who governs but what government is entitled to do that seems to me the essential problem." What government is entitled to do must be based on the situation at hand. A government limited to correctly handle a simple society of mostly small farmers will fail badly when faced with an industrial society and even more badly when faced with an Internet connected world. It will not have the powers to limit pollution, and so on. A government scaled to handle an industrial society will fail badly with a simple society of small farmers because it will be far too expensive and intrusive. And so on. There is no method of determining the correct size and powers of government without reference to the situation that the government is facing. As that situation changes with time, so must the scope and powers of government. Andy, I meant the man at Aquinas' feet who seems to be lecturing an an ant. Do you not recognise our old friend Averroes? Shame on you. Errm, you weren't really under the impression that the scheme was to be anything as primitive as Total_Votes = Votes_By_People + Votes_By_Dollars, were you?" You refused to define what you mean, then disparage those that don't understand your 'true meaning.... That's real cute. This i s the problem with Libetarians: They can't define their own philosophy, yet complain that everyone else has it wrong... Booger booger "BIG GUBMT" Boo hoo... It's just rubbish. If only we had a system where those with money had more power and influence... And we were rid of accursed Govt Regulation. It's great when business teams up with Govt to reduce those pesky 'regulations' and awful green tape. Just think of the Freedom enjoyed by those cotton irrigators, free of Govt intervention. Your contempt for freedom is an error. Freedom is what we all want. Some kind of regulation is necessary, but it isn't obvious that lack of regulation is the problem in this instance, and your uninformative link makes no case. Even the somewhat more informative Graun makes little case; most of the problem appears to be the weather. Freedom is a poorly defined concept. You obviously haven't read enough Mrozek. What I object to is zealotry. The Freedom we gain is always at the expense of something - in this case wildlife. In fact in almost every case it's wildlife. There are countless examples of the problem with idealizing 'Freedom' - whether it's your neighbours starting a piggery, or chicken farm or car wash. Or the frredom to hunt animals for trophy or sport. 'Freedom' is not necessarily a good thing, it's just 'A' thing that can be good and bad like everything else. Yes, drought... nothing to do with the vast water storages up stream. Hmmm seems highly unlikely. In fact with no regulation the situation would be far worse - why would irrigators in Queensland let any water flow down the river? The issue here is the interaction between surface water and groundwwater. During flood the river is a 'losing' river. During drought it would be a 'gaining' river. But the upstream diversions have been depriving the river of this bank-storage. So now the aquifers either side no longer support the river during drought. It has literally been starved of water. Freedom is well defined. I have read no Mrozek, and you aren't making it sound appealing. But, feel free to link to some if interested. The comment you made seems zealous to me. Is it possible that not everyone agrees what amounts to zealotry; and that if you're strongly partisan in a debate you may fail to see your own? You cannot gain freedom, only lose it. Without constraint, you are completely free (Hobbes, SoN, and so on). We voluntarily give up some freedom in return for the benefits this brings. Nonsense. I give up the freedom to my neighbours property, for example. That has no impact on wildlife whatsoever. Ditto almost all laws. Could it be that you're somewhat myopic about what cases you're considering? Freedom *is* necessarily a good thing - for you. And in the opinion of any other individual or entity, is always a good thing for them. Balancing freedoms of different entities requires - balance. "Freedom is well defined. " "Without constraint, you are completely free (Hobbes, SoN, and so on). " And this has no morality, because my actions being 'truly free' could be incredibly awful. "Nonsense. I give up the freedom to my neighbours property, for example. That has no impact on wildlife whatsoever. Ditto almost all laws." In these cases the wildlife already lost out to 'our freedom' in centuries past. "Could it be that you're somewhat myopic about what cases you're considering?" No, I am using the easiest examples at hand. I could use the freedom to fly drones in your backyard, to drive a bulldozer down through my neighbours houses. "Freedom *is* necessarily a good thing - for you. " well, yes, the issue is that it comes to conflict. It has to. We can't all be without restraint. "Balancing freedoms of different entities requires - balance." Oh God... This is just mental. I explain the requirements for regulation and how everyone being completely free is not necessarily always good. And in the end, after all this you agree with me. The problem you have is that this "Freedom" you speak of doesn't really mean anything, nor exist, because it needs to be balanced with the needs of others. We can't live together without it. This ability to negotiate balance is a uniquely human trait; so let's not rubbish our ability to make laws and regulations, because that's what gives us peace and the ability to live in large groups. It's trivially easy to grumble about Big Govt, and the awful nation of regulation and loss of Freedom, but these are Human innovations that deserve credit. The example I gave above was also more about the ODOV issue than 'Freedom'. Clearly when you give dollars more of a voice, the outcomes can be catastrophic. The Federal Govt here gave voice to the wealthier irrigators and watered-down the original regulation (The Murray-Darling Basin Plan). In this example they've actually worked to reduce Freedom - so the irrigators protect their freedom, which in turn reduces the freedom of people living downstream. The fish were merely an easy example, as they died.